Poor sales performance is a major contributor to the demise of many. Obvious on the surface however, what’s the problem? Changes in the market place, technological advances, disruption of key relationships, over dependence on one customer or key product and poor sales planning are all major contributors to failure. Two critical planning issues are, quantity and quality. QUANTITY - The almost sickening pace of ever-changing market conditions means annual sales plans (and budgets) are a thing of the past. In the current environment ‘living’ (continuous) plans, or at least quarterly targeting are needed. How quickly do motor vehicle models change, telephone systems evolve and computers become outdated? How quickly does a fickle customer base move to a new brand or make a substitute buying decision? Mechanisms for adjusting to an ever-changing reality are a must. Hotels can provide a great example of market place myopia and a reluctance to walk away from a traditional perspective. To start with, say we decide to focus on catering to the government sector which through budget constraints suddenly decides meetings, conferences and expensive ‘private room dinners’ are out. How about if we rely on the Japanese tour markets and the economy collapses and oops no customers and a lot of highly paid Japanese speaking staff who are doing little more than eating up the payroll. What if we set ourselves up as a five star super deluxe property that caters to high-end corporate customers and September 11 event occurs and everyone starts teleconferencing? The problem is that while, say the government sector is flourishing; often too little attention is placed on developing other markets. Constant repositioning and adjustment to capture market opportunities and close monitoring of market trends is a must to survive in today’s volatility. If we are going to cater for an ever-changing future we need to constantly train to meet that future. Many organisations (including hotels) don’t seem to invest enough in modern business methods and particularly in modern selling and lots of sales staff still do boring ‘presentations’. Example: I remember a tourism publication that stated that Thailand (a great holiday destination) is going to loose major market share because it can’t find trained managers to run its tourism related businesses. I mean the entire country may well suffer because a few key industry operators are too short sighted to invest in the ‘soft skills’ needed for the future. Thailand’s woes were exacerbate then of course by the political turmoil that racked the country for some years. A big danger that I have seen overlooked time and time again is … too much business from one customer. For hotels (as an example) this seems to be the problem of constantly struggling with big time ‘introducers’ whose buying power is so great they are able to command the market at minimal profit whilst reserving large percentages of a hotels inventory. I think perhaps the evolution of the modern independent traveller using direct ordering through the Internet may in time put paid to this lot. Hotel groups selling across the 3, 4, 5 star and super deluxe properties might give us all a clue on how we all need to think. Capturing different market segments and reducing our reliance on one or two major introducers should be a commandment. (I can never understand why more hoteliers don’t design individual properties that cater for a broader spectrum of customers, perhaps along the line of some cruise ships). Sound business practice also means sales people must think ‘big picture’ and to make sure they/we are acting as a ‘company team’ and that we are putting the organisation’s overall results ahead of our own ‘small area’ priorities. A friend in the event management business recently told me that he had two hotels in the same group arguing over his business and cutting each others prices and he was both amused and perplexed by this situation. He had decided that in future he was going to use another chain as although he had made a short term gain, the hotels sales team’s behaviour made him nervous and question their professionalism and he felt uneasy about accommodating his customers in either hotel. Were the sales operators of these organisations acting as a team and looking at the big picture… maybe not and what damage was done to the long-term result for the organisation and its prospect for future sales? 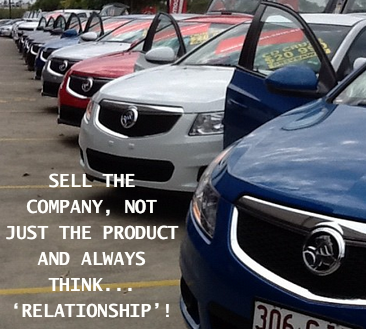 SELL THE COMPANY, NOT JUST THE PRODUCT AND ALWAYS THINK... ‘RELATIONSHIP’! Company difficulties can also arise from insufficient understanding of the competition and not knowing one’s strengths and weaknesses in relation to those of our business rivals and in relation to a changing market. This lack of knowledge and understanding will inevitably lead to us forfeiting opportunities. How much competitor analysis is undertaken by those businesses that fail? I suggest little or none. (Do we do competitor analysis and market trend analysis on a regular basis… no huh)? Managers need to carefully look at the total market for new business opportunities rather than just trying to do the same old same old at 110%. We must avoid becoming blinded by our own perspective (or lack of perspective) on the market or of becoming too immersed in operational details that can cause us to lose sight of how the overall operation is progressing. Lets face they guy on TV who sometime back said ‘Germany will never again be a leading economy if it insists on continuing to make manufactured products that no one wants to buy’, was right. The best production in the world won’t save us from the bloody-minded attitude that “this is what we do and we don’t want to change”. SHARP CORPORATION OF JAPAN STARTED OUT MANUFACTURING BELT BUCKLES AND MOVED ON TO MECHANICAL “EVERSHARP” PENCILS AND NOW…? ERICSSON ONCE SOLD ARMY BOOTS AND TOILET PAPER TO THE RUSSIANS. If your company is not constantly reinventing itself can I suggest your need to move to an organisation that is. The big question we all need to ask… Is my organisation moving with the times, does management have a sound vision of its future and is the vision appropriate for where the world appears to be heading?